We consider a situation where multiple parties, owning data that have to be frequently updated, agree to share weighted sums of these data with some aggregator, but where they do not wish to reveal their individual data, and do not trust each other. 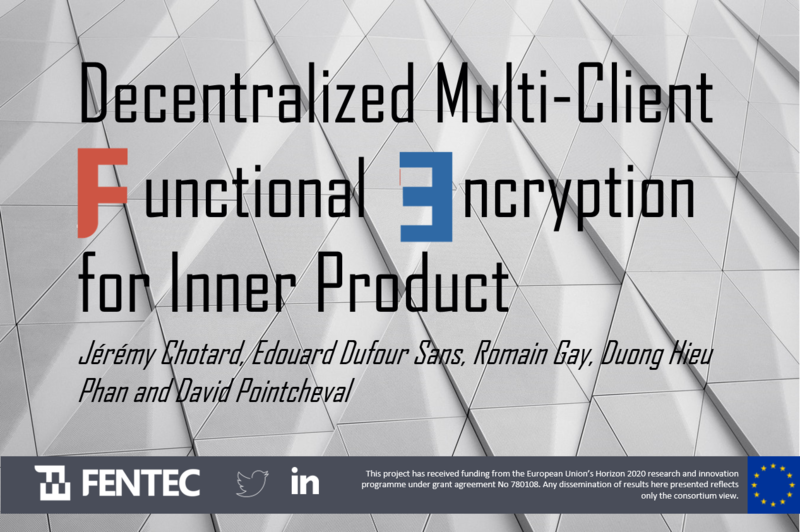 We combine technique from Private Stream Aggregation (PSA) and Functional Encryption (FE), to introduce a primitive we call Decentralized Multi-Client Functional Encryption (DMCFE), for which we give a practical instantiation for Inner Product functionalities. This primitive allows various senders to non-interactively generate ciphertexts which support inner-product evaluation, with functional decryption keys that can also be generated non-interactively, in a distributed way, among the senders. Interactions are required during the setup phase only. We prove adaptive security of our constructions, while allowing corruptions of the clients, in the random oracle model.